The Milwaukee Land Company was formed September 14, 1881, to buy, sell, lease, and improve lands along the westbound Milwaukee Railroad. It was specifically developed for Iowa, although it did acquire and develop some land in other states. The Milwaukee Land Company quickly established itself as an important adjunct to the Milwaukee Road, and through the combination of the two, the Milwaukee played a major part in the rapid development of the nation west of the Mississippi. The land company took over timber lands along the railroad lines and sold them to various lumber companies, with the understanding that the lumber companies would use the Milwaukee Road for the transportation of lumber on these lands. The land company also sold land to settlers, and to stimulate the purchase of these lands, the company offered to rebate the cost of breaking all soil broken within one year after the purchase of land from the company; $60,539.51 was credited towards breaking 24,731.77 acres of land in the first year alone. And, as in the case of Aspinwall, the Milwaukee Land Company laid out town sites and helped to populate the towns. By the end of 1881, the company had unsold lands in the amount of 186,531.74 acres in Iowa; within the year, nearly all had been sold. The average rate of the land sold was $4.66 an acre in Iowa, according to the 1881 year-end report. The Milwaukee Land Company was originally established for a 20-year period, and it was later extended for a similar period. Its management was to be always composed of the higher executives of the Milwaukee Railroad, and directors elected in June, 1882, included railroad president Alexander Mitchell and railroad general manager Sherburn S. Merrill. As general manager of the Chicago, Milwaukee and St. Paul Railroad, Merrill provided the "punch and drive" which helped make that company one of the leading railroads in the country; as president of the Milwaukee Land Company, Sherburn S. Merrill signed the papers which created Aspinwall. Aspinwall was platted August 21, 1882. Lots were drawn out for four blocks to the east and west, and for three blocks to the north and south. Of the 160 acres in the southwest quarter of section 15, the town in 1886 had 40.89 acres, the CM&SP Railroad had 29.19 acres, and the Milwaukee Land Company owned 89.92 acres. The Milwaukee Land Company's land was divided into four "outlots" and was located at the four corners of the town; this property was leased to farmers and continues today as farmland. For the railroad, the line was a very good investment. As early as February, 1884, it was said that the Milwaukee had captured one-fourth of the Chicago - Council Bluffs freight business and had "almost ruined the value of the passenger business" for other lines. In 1886, however, a decision by the Milwaukee nearly meant the ruin of Aspinwall. Milwaukee officials began to take notice of Sioux City and its importance as a packing center. In order to compete for the large volume of meat being sent to the eastern states, an extension was proposed from Sioux City southeast to the existing line across Iowa. The logical connection was at Astor, where the tracks began veering to the southwest and Council Bluffs. A Denison representative suggested an alternate route with fewer hills, making the connection two miles northeast of Astor. This site was thus selected and an entirely new town, complete with excellent railroad connections and a roundhouse, was created. Many businessmen from both Astor and Aspinwall realized the possibilities of this new town, and moved their stores and homes to the place being called Manilla after the twine which had been recently introduced to the farmers. In 1886, when Manilla was created, two passenger trains in each direction were going between Chicago and Council Bluffs; the trains made all stops between the two cities, including Aspinwall. All trains carried sleeping cars, dining cars, and a trip between the Missouri River and Lake Michigan took slightly more than 20 hours. In 1896, there were still two trains in each direction, but one had been elevated to "limited" status and did not stop at Aspinwall, or at many other communities. This train took a bit more than 14 hours for the Chicago - Omaha trip. The local train serving Aspinwall continued to carry a sleeping car, but not a diner, and its running time was the same as a decade earlier. 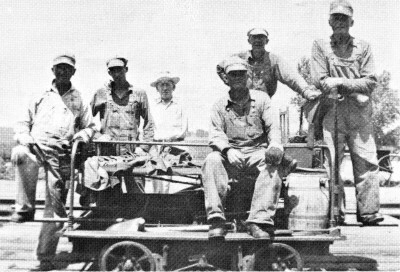 The Aspinwall section crew in about 1946 included, from left: August Ehrichs, Alvin Schilling, Depot Agent Ed Brady, Harry Schroeder, Bill Schroeder and Hans Clausen.